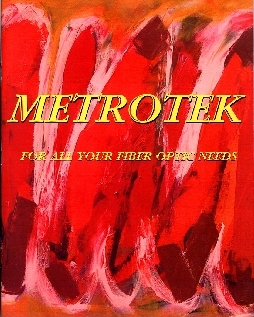 Metrotek is a Fiber Optic specialty Distributor with a large inventory of Fiber Optic equipment, supplies and accessories. We carry Connectors, Adaptors, Cable Assemblies, Attenuators, Links, Splices, Tools, Test Equipment and almost any fiber optic product used in the Telecom or Datacom industries. Browse our complete product listing with links to specific product information. Our current catalog which includes specifications and domestic (USA) pricing is available for FREE. If you do not already have our current catalog (see photo) you can request your copy by completing our catalog request form or by sending a request by any of the methods listed below. We Ship World Wide From Our Stock. Expert technical assistance is always available for your specific application at no extra charge. If we do not have what you need, we will recommend a source.